Dr. Piasecki has chosen to analyze the thought processes of the leaders of very successful enterprises and concludes that alertness to the need for change and societal concerns are the key drivers in their successes. "...AHC is a sustainability champion..."
"World Inc. captures...his vision into the future..."
"...he sets a new bar for achievement and a challenge..."
"...environmental leadership is sound business..."
"Describing a phenomenon he was instrumental in creating..."
"...not simply about doing good, but doing good business..."
"Piasecki has again discovered a critical alignment..."
"Every utility CEO...should read this book!" "...Dr. Piasecki's style reminds me of Thomas Friedman..."
"...nuanced balance between competition and cooperation..."
"...core principles and visionary insight..."
"...a source of inimitable competitive advantage..."
"...a higher order of vision, integrity, and leadership..."
"...a must-read for those interested in moving to the top..."
"...a rare but important vision into our future world..."
...and many others. And don't forget to see our book review clippings. "In World Inc. Dr. Bruce Piasecki sheds light on some profound changes taking place around the world, and the rapidly expanding role of global business enterprises in shaping the future. It is an eye-opener." "We can't steer by the old lights, and ventures like AHC, people like Bruce, are engaged in a process of informed guidance, helping enterprise around history's sharp corners by putting language to current and impending conditions. Either the world is headed toward sustainable practices, or the world is drifting toward trouble and the ruin of all systems as we presently understand them. AHC is a sustainability champion. That has great value; that's real currency." "I have not read in several years a book with such an immediacy of application. World Inc. presents an ability to integrate, in a simple and direct approach, an astonishing number of onrushing global variables in a way that can be quickly read, understood, internalized, and immediately related to a business executive's current pressures." "Bruce Piasecki has spent his career bringing people together to discuss the challenging issues of the times. If you spend much time with Bruce, you'll undoubtedly notice that he listens intently and takes copious notes. He always knows when to inject a certain catalyst to spark and stimulate the discussion. World Inc. captures many of these thoughts and his vision into the future, and offers a unique opportunity to benefit from these hundreds and thousands of encounters that Bruce has experienced." "Riveting is not a word normally associated with business books, but that was my first reaction to Bruce Piasecki's latest contribution to the literature on sustainability...and that was after only the first chapter. Five years ago the topics of green and sustainability suffered from nebulous definitions and uncorroborated testimonies. But as the topics have matured, we find both tremendous responsibility and business opportunity embedded in our responses as corporations and communities. Bruce takes us to the next level in World Inc. Through thoughtful commentary and concrete examples he sets a new bar for achievement and a challenge for innovation in not only products, but in the very way organizations are managed and respond." "World Inc. ably demonstrates that we are indeed becoming one world. Corporations can either step up to their role as good stewards or pay the price in the marketplace. This book should be on every decision-maker's desk. Kudos to Bruce Piasecki for doing the work necessary to bring about this much needed paradigm shift." 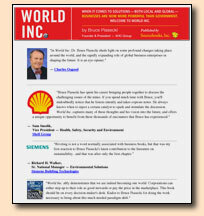 "In the past, [AHC Group workshops] have considered some of the major environmental issues of the day — and in his latest book, World Inc., Bruce Piasecki has captured some of the most powerful cases of this exchange that supports the conclusion that environmental leadership is sound business and can also meet the expectations of society." "Describing a phenomenon he was instrumental in creating and stimulating, Bruce Piasecki, PhD, in his new book World Inc. is alerting the world to a new efficient resource for solving some of our more serious global problems. He asserts, convincingly, that major corporations are rapidly not only assuming responsibility for the unintended consequences of their productive activity, but taking an aggressive leadership role in addressing issues such as global warming, renewable energy, resource conservation, and sustainability. I have had the pleasure of watching Bruce over the past 20 years as he has advocated for responsible corporate leadership, provided stimulating benchmarking conferences and influenced and applauded the actions of Toyota, HP, Dupont, Whirlpool, Suncor, and numerous others as they took positive action and set examples. For those who have not had the pleasure, this book will provide some hope for a brighter global future through the efforts of unsung corporate heroes." "No business can remain competitive, open to new markets and new opportunities, without driving every level of its business toward the concept of social response capitalism and product development. World Inc. demonstrates that corporate social responsibility is not simply about doing good, but doing good business by developing products that the market demands — and which also deliver value to shareholders and society alike." "In 2007, with the emergence of huge multinational companies, Piasecki has again discovered a critical alignment that will shape our future. Companies, rather than nations, are taking the lead in social causes such as environmental sustainability, energy conservation and worker safety. World Inc. discusses the alignment of these social causes with the core financial and quality demands of corporations in the marketplace. Business leaders will want to read Piasecki's exploration of this new alignment and what it means to future corporate competitiveness. Activists in the causes of energy, environment and health must read it as a handbook to new partners and tools in pursuit of their vital missions." "Dr. Piasecki's style reminds me of Thomas Friedman, whose gift includes the ability to frame complex issues and communicate them in an easy-to-understand and engaging manner. And by demonstrating a pragmatic insight of business, Dr. Piasecki has convinced me that our future is secure. The 'green' appetite by the consuming public will continue to accelerate exponentially as the participation of more socially responsible corporations grows. Everyone benefits! "I'm confident that Dr. Piasecki's work in transforming companies and public expectations is what will attract many to this kind of work in the near future." "In World Inc. Bruce Piasecki solidly conveys the ever successive need to grasp the interdependence between products, profits and people. It is accessible, honest and the next must-read for business leaders genuinely seeking to understand the future of sustainable development in the lineage of Hawken's Ecology of Commerce, Zadek's Civil Corporation, Elkington's Cannibals with Forks and Hopkins' Planetary Bargain." "The guiding value of what Piasecki terms 'senile' capitalism was profit maximization through raw competition. That was surely the dominant operating principle of business in the late 19th and early 20th centuries. More recently, it spawned a wave of contempt for government and a profound suspicion of regulation. But I think that 'socially responsive' capitalism requires a much more nuanced balance between competition and cooperation." "In World Inc., Bruce Piasecki invites us to view business from a new perspective — one which offers inspired possibilities for a better world from designing better products. Through social response we are called to a higher order of vision, integrity, and leadership for managing our businesses in the 21st century." "What Bruce Piasecki sees will surprise and inspire you. More important, it will offer you — as an investor, consumer, business leader, or activist — the core principles and visionary insight you need to identify which companies will succeed in the 21st century, and how the result will be a better society." "In his book, World Inc., Bruce Piasecki explores the changing role of business in the 21st Century, and the strategy of business sustainability as a source of inimitable competitive advantage. Today, as many business leaders revisit the question — 'What will it take for our company to continue its rate of growth for the next 20 years?' — they find that the answers for the next 20 years are markedly different from those of the past. Bruce contributes to this discussion by going beyond the usual topics of resource capacity and the unintended consequences of world economic development, to examine the changing role of business, and the capabilities and strategies required by leaders to excel in the empowered, social network of the emerging global economy." Corporate Strategy & Finance, Wal-Mart Stores, Inc.
"World Inc. is a watershed book that is not only relevant and topical, but vital. Bruce Piasecki lays out the moral imperative for our business and political leaders. The game has changed. To be successful in the twenty-first century, all stakeholders must be taken into consideration, from shareholders to workers to citizen-consumers. We will only survive if we work together for the betterment of all. Few people are as qualified as Dr. Piasecki to lead this charge. For anyone concerned about the future, World Inc. is a must-read." "As a utility industry executive who believes that deployment of sustainable technologies and environmental leadership are necessary strategic ingredients for the utility industry's success in the 21st century, this book is particularly timely. Every utility CEO, energy policy maker, and regulator should read this book!" — Hugh Baker, President, MeterSmart L.P.
"This book should be read by all consumers and corporate managers who care about the future of this planet. This very readable book points towards practical and pragmatic solutions to designing and manufacturing products that enhance our twenty-first century lifestyles without depleting earth's finite resources." "If ever there were a time in the corporate governance and environmental arenas where the insights of the activist could provide value-added to the corporate businessman today is that time. Piasecki lays out near term solutions to current relevant issues that will help ensure your business's long term market success. "The pragmatic view Bruce Piasecki conveys on implementing change processes here build on his successful 1990 book In Search of Environmental Excellence: Moving Beyond Blame. "By addressing consumer products and services through case studies and the end user's viewpoint Bruce Piasecki clearly demonstrates how today's informed consumers are demanding more than merely high quality and low cost - they have a larger sense of value. By adopting his thesis on social response product development insightful and entrepreneurial businesses will be able change their corporations to better serve their customers and capture additional value. "A must-read for those interested in moving to the top, or staying there, in their industry sectors over the next five years." "Much as Daniel Goldman redefined intelligence as both emotional and social, Bruce Piasecki recasts 21st-century business leadership as globally-minded, inclusive of brilliance in its many forms, and keenly aware of its complex and multi-faceted role in today's world. An insider's book, World Inc. challenges corporate leaders to use their credibility and influence, and to take responsibility to shape the vision and strategic direction of businesses. He clearly and succinctly builds the case for moving — from independent profitable entities — to change agents in a larger world community that influences us physically, emotionally, and systemically with an aligned social consciousness." "World Inc. proves that when companies get the priorities right, they get everything else right, easily and rapidly. They earn 'more profit' by making profits clearly their second priority. Who wouldn't want to work for such a company? Who wouldn't want to invest in it? Bruce Piasecki provides a clear win-win that shopkeepers in small towns have known forever but that has gotten lost in the abstractions of multinational finance. This is a recognition of an awareness we had lost, a wake-up call from a long slumber." — Terry Mollner, President, Trusteeship Institute, Inc.
Terry is the founder of Trusteeship Institute, a group which mainly consults to firms converting to employee ownership based on the Mondragon model. He has been actively involved with the Boards of The Calvert Social Investment Fund, the Association of Humanistic Psychology, and The Institute For Community Economics. "Bruce Piasecki has authored a new and important book, World Inc. Bruce is one of the pioneers bringing business and environmentalists together in a way that raises consciousness on both sides. He has been an instrumental consultant to major corporations, as well as a successful author of several books on corporate environmental strategies. Anyone who is working in the general areas of energy, environment, global change and/or corporate responsibility may find this of interest." "Leadership in the corporate world involves many aspects, as described by the author; however, anticipation of change, willingness to invest based upon a look beyond the horizon and a commitment to the long term health of the planet is the centerpiece of this book. "Dr. Piasecki has chosen to analyze the thought processes of the leaders of very successful enterprises and concludes that alertness to the need for change and societal concerns are the key drivers in their successes. As the author concludes, 'those that do not address these drivers will be consumed or cease to exist.'" A leading member of select boards and advisory groups, Kenneth R. Dickerson was Senior Vice President of External Affairs of Atlantic Richfield Company. His responsibilities included the company's government and public affairs, community affairs, communications, media, environment, health, safety, remediation of waste sites and the ARCO Foundation. "Dr. Bruce Piasecki's most recent book, World Inc., presents a rare but important vision into our future world — a robust world where 'buy and sell' decisions are made not only on the basis of price, quality and availability but also on the basis of environmental, social and economic criteria that occur across the value chain of products and services. "Those in Corporate America who are early movers in integrating these essential concepts launching superior products and services will be rewarded in the global marketplace. Dr. Piasecki has focused on the leaders of two companies (HP and Toyota) to show how these early movers are developing sustainability strategies that are already showing early signs of success. "The author also makes the contrasting point that those companies who are slow to move or don't move at all into these sustainability strategies risk the potential of being added to the growing scrap heap of companies who have failed to heed past visions of change in a timely manner." "By linking environmental and social performance to product differentiation at major companies such as Toyota and HP, Bruce Piasecki has illuminated an important source of competitive advantage and stock value in the 21st century. Told in a colorful and engaging style, this book is a shaper of things to come. Executives who want their companies to achieve industry leadership in the coming 60 months would do well to read it!" Chris Laszlo is the author of The Sustainable Company: How to Create Lasting Value Through Social and Environmental Performance (Island Press, Fall 2003). For ten years, he was a senior executive at Lafarge S.A., a world leader in building materials, holding positions as head of corporate strategy, general manager of a manufacturing subsidiary, and vice president of business development. "A powerful book to document and support social responsibility and environmental awareness among successful leading 21st century businesses. Well documented with case studies from Toyota, Hewlett-Packard and other familiar companies in this very well written and interesting book. Important reading for all forward-looking executives and managers." Endorsement by Paul Bray, Esq. "World Inc. opens the window on the coming of age of business social responsibility and reveals the forces at work requiring business leaders to anticipate the near future and what this will mean for the consumer and society. "Piasecki thoughtfully reveals why Toyota's break through and efficient hybrid auto, the Prius, is the vanguard of a product development trend that adds social response to the traditional drivers of price and performance." Paul's company offers services in areas of environmental, planning law, and bill drafting. Bray has extensive experience with the New York State Legislature. "Bruce Piasecki documents the emergence of an important new business strategy, social response capitalism. Grounded in the experiences of such major corporations as HP and Toyota, he uncovers the common threads that position these corporations for success in a new business context dominated by environmental and social challenges and conscious consumers. "World Inc. will challenge business leaders to see competitive advantage in developing environmental stewardship and social response capabilities. This book will challenge skeptics outside the business community to begin to see how business can be a significant partner in the transition to a more sustainable world." "Bruce Piasecki's latest book, World Inc., is the unfolding story of the design revolution where the mind is designing away the past mistakes of the First Industrial Revolution. The implications of the design revolution will unleash a more perfect form of capitalism, making products not for people but about people." GreenWave Radio is a nationally syndicated radio talk show heard on Business Talk Radio Network. In 2002, Chandler was the recipient of the nation's top conservation award, the CheveronTexaco Conservation Award.